Feminists deny this, claiming they don't prefer women work outside the home; they only want women to have the choice to do so. But if that were true, why did congressional Democrats -- the women in white, feminists all -- jump up and cheer? One reason bears testimony to the thesis of a recent column I wrote: The greatest fear in America is fear of the left. 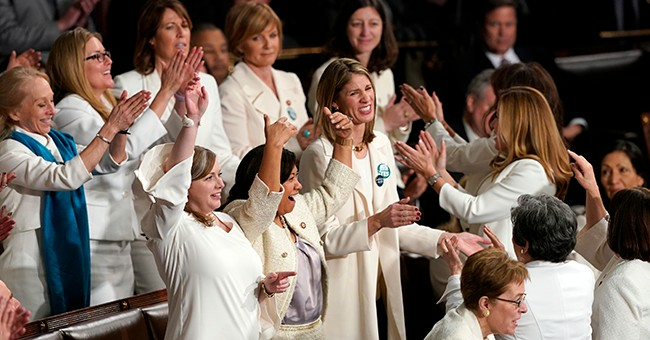 The last thing Republican members of Congress wanted was to be photographed sitting quietly after the president of the United States announced, "All Americans can be proud that we have more women in the workforce than ever before"-- especially while every Democrat was standing and cheering. The left-wing media, meaning virtually all mainstream media, would have depicted every such Republican "sexist" and "misogynist."